The Global Lens 2010 international film series features independent films from around the world depicting stories about different cultures and people. A special curated educational screening of one of four selected films in the series will be held each month at the Hillyer Art Space in Dupont Circle. The screening is free for students with a valid student ID and there is a suggested donation of $5-$10 for other audience members. Refreshments will be served and a special Q&A with Reel Worldwide Underground Link (RWUL) will be held after each screening. 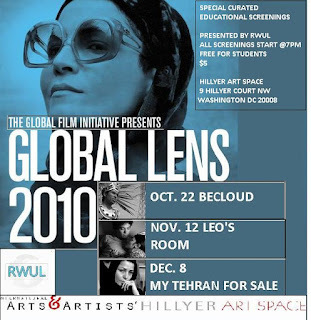 The non-profit organization Reel Worldwide Underground Link (RWUL) was selected by the Global Film Initiative to host the Global Lens 2010 film series in Washington, DC. RWUL has hosted screenings in DC of this series all year long. The Hillyer Art Space and International Arts and Artists will curate these films in conjunction with existing exhibitions.